An upcoming visit by Indian PM Narendra Modi may lend some needed momentum to ties. Over the past six months, Russia has made its presence felt in the global realpolitik scene with gusto. With the Kremlin militarily intervening in Syria, reportedly bombing ISIS and in effect protecting Bashar al-Assad’s regime in Damascus, while juggling a yet unresolved Ukraine crisis and dealing with Western sanctions… Moscow has its hands full. Most aspects of India-Russia bilateral ties are quite institutionalized, and work in an automated manner irrespective of who is in power in New Delhi or Moscow. Russia could perhaps be seen as India’s only definitive “strategic” partner in its truest form, and this unique relationship has developed over decades. However, over the past year the Moscow-Delhi dynamic seems to have lost some of its previous momentum. This may now be about to change, with Prime Minister Narendra Modi preparing to make his first visit to Moscow early next month. Russia’s economy is in crisis, with oil prices below $50 per barrel at a time when Russian President Vladimir Putin is wielding Russian military power in the global political theater. With Ukraine to Syria, Russia is involved in external military operations that analysts believe are unsustainable for the long run given Moscow’s current economic environment. When Putin visited India in December 2014, a few months after Narendra Modi won a historic election and became the new prime minister, the Russian president’s stay was cut short from a planned three-day visit to one lasting barely 23 hours. This was largely due to the Ukraine crisis, which was peaking at that point. After this visit, the noose of Western sanctions on Russia tightened, and Moscow began looking at India and China to boost its own finances at home. Moscow’s attempts to compensate for oil revenues with defense revenues for its exchequer are not easy tasks to achieve. Russia’s reaction to losing Indian helicopter deals and MMRCA fighter jet deals to the United States and France was to make its displeasure known by a sudden affinity to bolstering Russia-Pakistan ties. In what seemed like a contemptuous move against Delhi, Russian Defense Minister Sergei Shoigu, who is very close to Putin, visited Islamabad in August, a trip that saw both countries sign defense agreements including the sale of Mi-35 “Hind E” attack helicopters, a variant of the type also operated by India. To push the envelope a little further, reports surfaced last month that Moscow and Islamabad were in talks for the former to sell its top of the line Sukhoi 35 fighter jets to Pakistan (India operates the Sukhoi 30MKI variant). Both of these developments naturally created ripples in the Indian strategic and defense affairs discourse. However, this realpolitik maneuvering by Russia is mostly to send a message to New Delhi about the latter’s growing clubbiness with Washington. Moscow is not used to losing out on Indian defense contracts, which it sees as a significant part of its arms export pie. Of course, for the longest time India had few options other than Russia for its defense needs. The recently concluded aircraft carrier saga between the two nations that gave India the INS Vikramaditya (formerly the Admiral Gorshkov with the Russian Navy) could be seen as something of a turning point, where the project cost India much more than expected and Russia acted arrogantly on the questions of price and delivery schedules. For now, analysts are confident that Russia will in fact not sell the Sukhoi 35s to Pakistan. Even after considering the above parameters, India is still investing in Russia and helping Moscow more than perhaps the Kremlin would like to publicly acknowledge. New Delhi was vague at best, flirting with support for Russia’s annexation of Crimea and later gave some sort of backing to Moscow’s bombing campaign in Syria. On the economic front, India’s ONGC Videsh has continued to invest in Russian energy sector with only last month buying a 15 percent stake in Russia’s second largest oil field for around $1.27 billion. Beyond this, India is also keen to go deeper into Russia’s Arctic regions and jointly work on the exploration and production of oil and natural gas, establishing itself as a long-term player in the country’s energy sector. To give some further relief to Moscow in its sanction ridden economic woes, Indian dairy companies are keen to enter the Russian market, which will allow Russia to deal with its growing food crisis, specifically milk. Currently, Russia is using its relations with Belarus to get around European Union (EU) sanctions, using Minsk as the middleman to plug its gaps. For a small country, Belarus’s imports of milk from the EU reportedly went up by a factor of 573 last year, with the extra supply of course being handed over to Moscow. Belarus at the same time has also become a net exporter of fish, an astonishing achievement for a land-locked country. It is true, however, that Russia has been unnaturally absent from Modi’s global outreach over the past year. During this same period, the Russian economy has been hit on two major fronts, oil prices and sanctions. In the run-up to Modi’s meeting with Putin, India’s Defense Minister Manohar Parrikar during a visit to Moscow agreed to purchase Russia’s advanced S-400 Triumf air defense missile system for a whopping $10 billion. And this is precisely what Moscow wants from New Delhi, the continuous dominance of its defense partnership with India. However, Putin must realize that India’s political mileage in the global arena is much stronger than it used to be. India can now afford to buy better and more reliable weapons even if they cost more than what Russia has to offer, if what it is offering is not up to the expectations. There are no major scars in the India-Russia dynamic, but Modi’s visit should successfully inject that much-needed oil into the political machinery between the two states. The need for this visit by Modi has become more than apparent over the past few months, and both Modi and Putin will welcome this opportunity for a course correction. 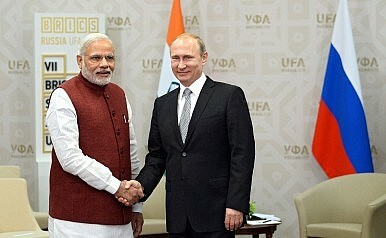 New Momentum for India-Russia Relations? In a state visit, Indian PM Narendra Modi gives the relationship a boost.